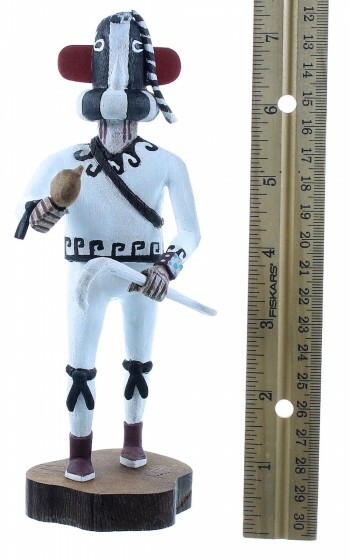 Kachina is approximately 8" tall including a 1/2" base, and is 2-1/2" wide at widest points. This kokopelli kachina is an absolutely exquisite display of worksmanship, hand carved by the great Joseph Duwyenie. Joseph Duwyenie is an experienced carver. Carving is a family tradition that was taught to him by his father, and like his father, he has passed it on to his sons. Joeseph started to carve in 1970. 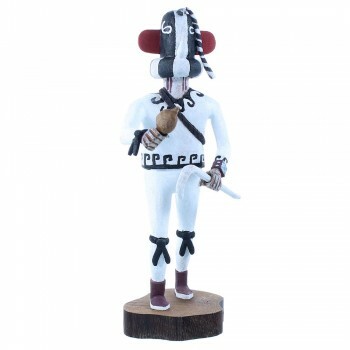 He has a distinctive style in the way that he carves the feathers and wings of his Kachinas. He also likes to change the style of colors on each Kachina that he makes. Joe enjoys the time he takes to carve and paint each Kachina doll. This Kachina Doll is made of cottonwood root and is signed on the bottom of the base "Joseph Duwyenie". If you would like to see a picture of the signature on the bottom of the base or more pictures of the doll please let us know. 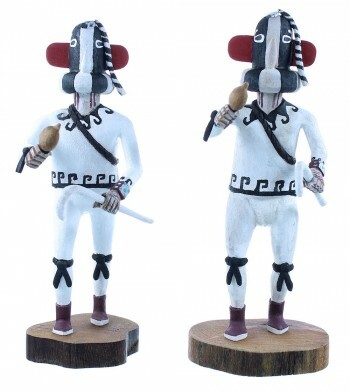 We are PROUD to bring you another amazing Kachina Doll! Dolls like this one are the reason we are the #1 NATIVE AMERICAN ART SELLER!